I’m a big fan of remote pair programming. The problem I often run into is the need to share a web browser. In the past I have always jumped strait to a screen sharing tool like Join.me or TeamViewer. The problem here is these technologies tend to use quite a bit of bandwidth. 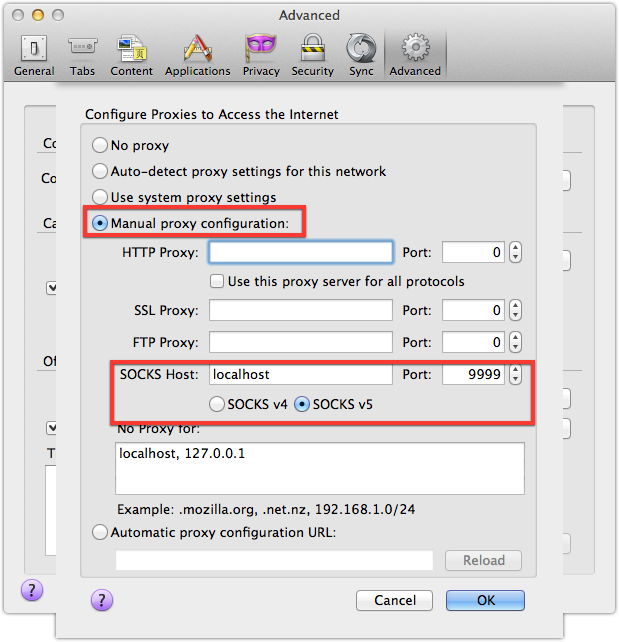 The solution recently I have found is to use a SOCKS proxy to the hosting machine. The proxy allows us to tunnel our traffic through that person’s machine and therefore allowing you to access things local to them like a VM which may not be publicly accessible. This solution also has the added benefit of the remote pair not needing to do anything but have an ssh server running. Let’s explore this ssh connection string! First the -p flag followed by the port your pair is running their SSH server on. This flag is optional if your pair is using the standard port 22. Next we include the -N flag which which tells ssh client to not execute remotely which keeps the process running in our shell allowing us to close the tunnel with a ‘Control+c’. After that another flag is the -D which actually is the SOCKS proxy flag. This flag takes a port number as an argument. This port number needs to be open on your machine. It is the port that your browser will connect to to tunnel traffic to your pair’s machine. Then we’ll need to finish filling out the username and server information. Once you have the command filled out hit enter to start the tunnel running. After our tunnel is running we just need to configure our browser to use the SOCKS proxy. The easiest browser to setup for a SOCKS proxy is Firefox so we’ll need that installed on our machine. 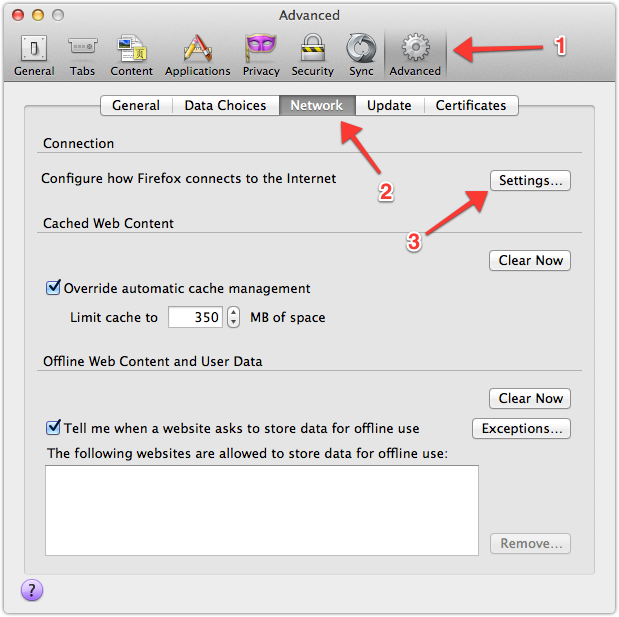 Next we’ll need to open Firefox preferences and navigate to the ‘Advanced’ section (1). Once there we’ll want to go to the ‘Network’ preferences (2) and choose the ‘Connection’ settings (3). After clicking OK and closing all the preference windows you’ll be able to use Firefox to browse the web through your pair’s internet connection. Like always when remote pairing, etiquette is key and make sure you are using this browser for activities that you need to and not for internet searching, email, etc. All of your traffic for this browser will be going over this tunnel and through your pair’s machine. Using this tool in-conjunction with Joe Kutner’s Remote Pairing: Collaborative Tools for Distributed Development tmux pairing setup will give you a very low bandwidth solution to web development remote pairing.